Thereupon she propitiated the ascetic Gautama saying, "O twice born one, I was unwittingly ravished by Indra, assuming thy form. I have not committed this willingly, O ascetic so do thou be propitiated with me." Ahalya having said this, Gautama replied "In the race of Ikshwakus, there shall be born a highly effulgent and mighty car warrior, known in the world as Rama; for performing the rites of a Brahman, the mighty armed Vishnu, assuming a human form, shall repair to the forest. How does the Critical Edition of Vālmīki Rāmāyaṇa resolve this contradiction? Is the verse from Uttara-kāṇḍa present in the critical edition? Thereupon she propitiated the ascetic Gautama saying, "O twice born one, I was unwittingly ravished by Indra, assuming your form. I have not committed this willingly, O ascetic- so do you be propitiated with me." But the above verse is not present in critical edition of Valmiki Ramayana found here or here. 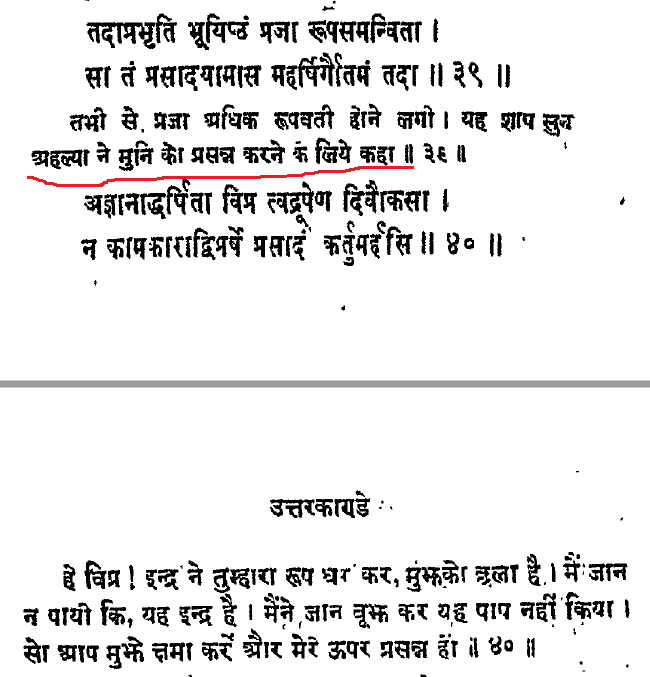 As shloka clearly says that these lines were said by Ahalya to propitiate Gautama so they might not be 100% true. Not the answer you're looking for? Browse other questions tagged mythology ramayana indra critical-edition ahalya . Was the story of adultery of Indra in the story of Ahalya a PRAKSHIPTA? Who freed Rambha from Vishwamitra's curse?